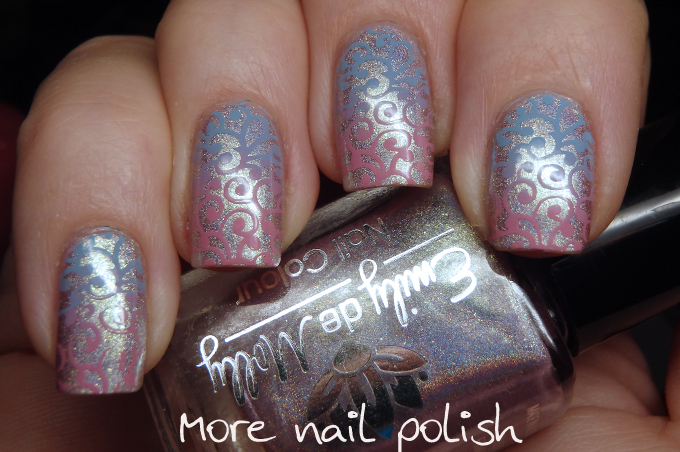 Messy Mansion stamping polishes and Emily de Molly shimmers and holos. A few weekends ago I attended a local launch party for the new Messy Mansion stamping polishes. The afternoon was lots of fun, there were about 20 ladies there all having a play with stamping, learning techniques such as regular stamping, gradient stamping and lead lighting. 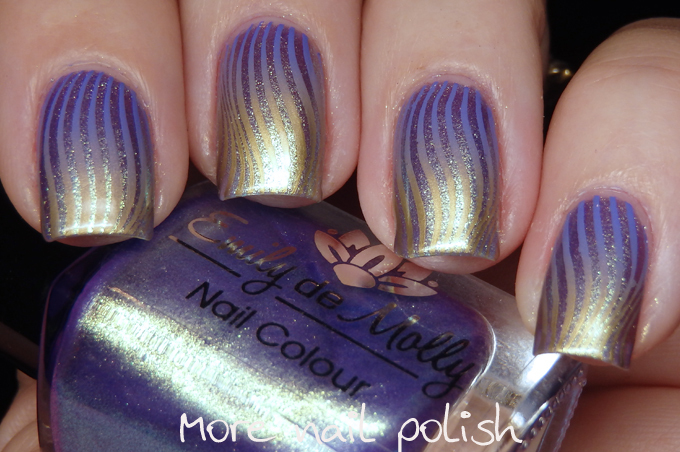 I took the chance to catch up with some of my nail friends, including Hayley from Emily de Molly. Hayley had a couple of new polishes for me to try, so I promptly removed my existing mani and put on the new polishes and then had a play around with some of the stamping products. I did two different designs, one on each hand, because that's just what you do at these sorts of things to make sure you try out a few different looks and different polishes. 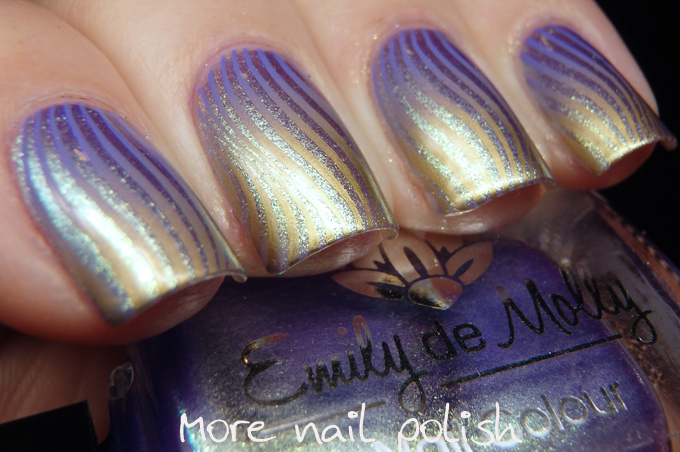 This first one is Emily de Molly Savvy Trinket, which is a strong shimmery polish with gold to green to blue colour shifting shimmer in a purple base. I stamped over it with a new Messy Mansion stamping polish called Royal Purple from their new stamping line of polishes. I also used the metal template from the Accessories Kit 2.0 to only stamp the 'V' part of the design. On my right hand I applied Emily de Molly Iridescent Skies, which is one of three exclusive polishes created for the @hellaholocustoms members. It's a lavender pink holo with a purple shimmer. I then did some gradient stamping using Petal and Hydrangea Blue Messy Mansion stamping polishes. Let's also just admire my delightful hand pose with my right hand for a moment. WTF. My right hand will just not go where it needs to for a photo. Left hand, easy, it just falls into place. Right hand, I had to actually physically move fingers to even get it to look this good. When I got home from the gathering I had to change my mani's so that all 10 fingers matched for work the next day. This is what I ended up creating. Again I use Emily de Molly Savvy Trinket as the base. I then did some gradient stamping using Mundo de Unas purple and gold polish and using DRK stamping plate XL Magic Garden. See I told you I keep using that plate! I loved this so much. 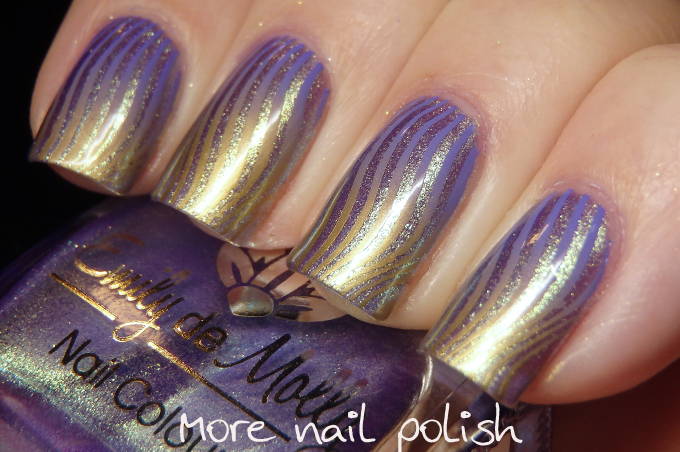 The purple to gold gradient stamping really accentuated the duochrome appearance of this polish with it's purple base and colour shifting shimmer. Hayley also gave me a bottle of Flatline. Ohhh WOW. These photos were taken on day two when the sun was actually out. 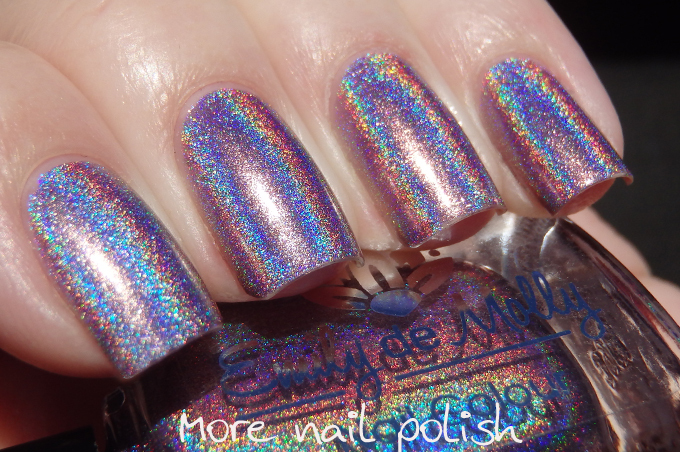 Look at that holo. This polish really reminds me of OPI DS Original in terms of colour. I might have to put them side by side to compare how similar they are. Emily de Molly polishes provided for consideration.